Backing Up EasyDose is very simple when the right location is selected. By Default EasyDose prompts you to backup once per day. Manual backups can be instigated at any time from the Maintenance menu. 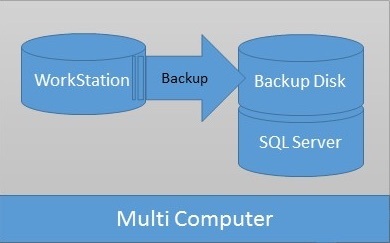 To successfully backup EasyDose, you must understand a little about SQL-Server and the EasyDose program and its setup. 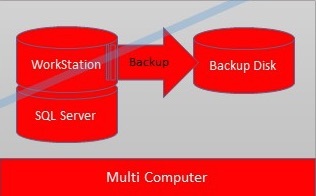 Setup and Backup Scenarios for EasyDose are explained and depicted below. MS-SQL Sever is situated on a separate computer to the EasyDose program. 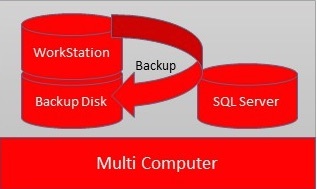 This would apply where the SQL-Server is setup on a dedicated Windows server OR in a multi workstation environment. 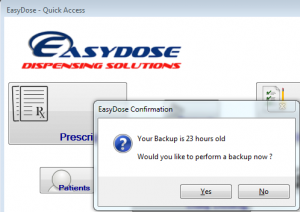 This is the most common and simple method of backing up EasyDose. By default, during the time of installation of the MS-SQL database, a backup directory is created for all MS-SQL data. If you wish to change this backup location to a folder on the computer where SQL is installed, you can create a folder on your C Drive – e.g. C:\EasyDose_Backup\ and backup to there. Under this scenario, it may be prudent to have a third party program copy the backup file to an other location, on or off site. 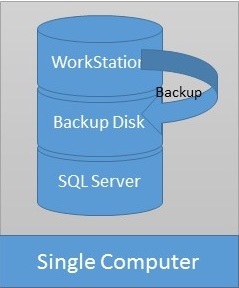 For this scenario to function correctly, the user must Share the backup destination Folder on the computer where MS-SQL is installed, and backup to there. This location must be accessible via the network. – e.g. All of these locations will work under this setup. For this scenario to function correctly, the user must again Share the backup destination Folder on the computer so it can be accessed via the network. – e.g. This is the least common and least desirable scenario and should not be attempted without technical support. This is tricky as the matter relates to MS-SQL server and permissions and not the EasyDose program. It is actually outside the scope of EasyDose but we can provide some assistance and advice in relation to this matter. MS-SQL and the destination folder must have the necessary permissions for the MS-SQL server to access it. 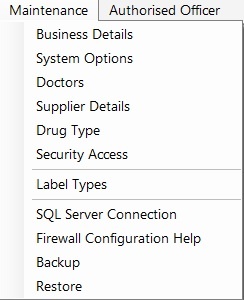 SQL settings are set in Control Panel > Administrative Tools > Services > SQL Server (EASYDOSE) > Log On > This Account. Setting the user account to a name/account which can access the destination folder will allow EasyDose to direct the SQL Server to backup to that location. Security Permissions may also need to be changed/set for the destination folder. The named accounts will be known to the Support/IT Staff. The permissions and settings for this should only be performed by your Support/IT Staff. This link to the backup error webpage will also be beneficial to user if a backup error occurs. which consists of places like My Documents, My Desktop, My Pictures etc. In a Multi Terminal Site, you need to consider that the location you save to, must be commonly accessible to you – the user, and the Server user – ask your Support/IT staff for the best backup location. EasyDose Staff do not assume responsibility for the safe storage of backups – again, ask how to check backups if you are not sure. The Backup form can also be opened from the Maintenance Menu. EasyDose does not. It requests the MSSQL server to perform the backup. Where can I backup easyDose data to? As outlined above in the 4 scenarios. Scenario 4 is not recommended. Can EasyDose backup to an external drive? Can EasyDose backup to an external device such as a USB or External Drive? Is EasyDose responsible for the safe storage of data and backups? No. The responsibility rests with the operator. EasyDose V2 DOES NOT automatically backup your data. At all times, the end user is responsible for backing up their own data. It is always prudent to have a backup of your EasyDose database off-site.